Millions of tons of plastic are polluting the world’s oceans. It reaches the oceans through rivers and waterways, and then accumulates in five high-concentration areas called gyres. Boyan Slat, a student at the Delft University of Technology, and his Ocean Cleanup team believe that it’s possible to remove most of the plastic from the oceans in only five years using a series of floating filtration platforms anchored to the ocean floor, and massive floating booms attached to the platforms. By using floating booms instead of nets, much larger areas of the ocean will covered, and even the smallest particles will be diverted and extracted. 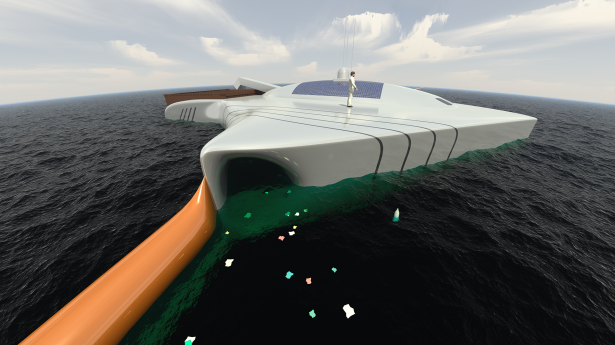 When multiple platforms are placed in an array, they can take advantage of ocean currents to funnel floating plastic matter to the platforms and remove it from the water. The contest starts today and ends November 15, so don’t wait to get your entries in. Visit http://www.oceancleanupcontest.com to learn more and enter for a chance to win! * The Contest is open to any private individual of any age, except for residents of a country under a United States embargo; residents of Belgium, Norway, Sweden, Brazil and the Canadian province of Quebec; residents of any other country or territory where participation in the Contest, as well as the terms of the present rules, would violate applicable local laws; employees of Dassault Systèmes that directly, or indirectly, participate in the development of The Contest; or spouses and family members of the employees of the aforementioned company. Any person under 18 must obtain the prior written authorization of the person(s) having parental authority over this minor to participate. No purchase necessary. Visit contest website for complete rules.